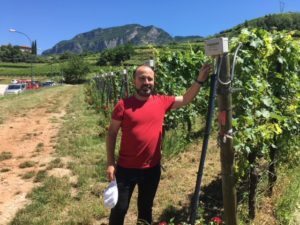 Dr Valerio Mazzoni points to his prototype mating disruption system, sending vibrations down the vineyard wires against Scaphoideus titanus, the vector of the disease Flavescence dorée. 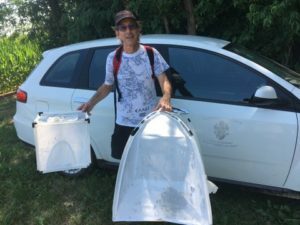 Max Suckling holds cages containing large numbers of Brown Marmorated Stink Bug nymphs and adults collected from a massive outbreak on kiwifruit and pears in Friuli, Italy. After a gap of 37 years between his first paper as a zoology student at Massey University on predatory and beneficial stink bugs, and only his second stink bug paper last year on sterilisation of , Max Suckling is learning to be a bug hunter for this new invasive threat. 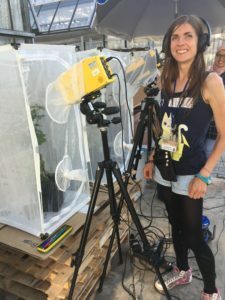 Italian PhD candidate Sabina Avosani uses a laser vibrometer to eavesdrop on spittle bugs. She plans to visit the Biosecurity Group at PFR Lincoln for several months this year, to help with biotremology research on tomato potato psyllid in the PFR MBIE program “Realising Potato Export Growth”. NZIAHS granted him a Trimble Award to visit colleagues in Italy, where the Brown Marmorated Stink Bug is rampaging through horticultural crops including apples, pears, kiwifruit, grape vines, corn and other crops. His projects include gaining practical experience with traps and aggregation pheromone lures for surveillance and suppression, as well as further evaluation of the potential for the sterile insect technique to be used in the event of an incursion into New Zealand. Regular interceptions by the Ministry for Primary Industries and media interest with ships being turned away have given BMSB work some urgency, which NZIAHS recognised. The research team at Fondazione Edmund Mach near Trento, in northern Italy, are working on an exciting new lead against these types of bugs. 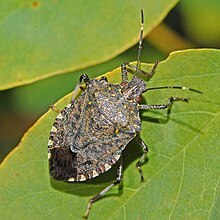 Pests such as the meadow spittle bug (present in New Zealand) and glassy winged sharp shooter (present in the Cook Islands) are vectors of a major bacterial pathogen (Xyllela) that is killing olives in Europe and has badly affected grapes in California. These bugs use low frequency sound to communicate with each other and the Italian team are pioneering trapping and mating disruption systems, redirecting vibrational communication against the bugs in the same way that Max and colleagues have developed insect pheromones for horticultural crops in New Zealand. He says Trimble Awards and other grants from the NZIAHS are an important means by which our researchers can pursue important new scientific leads, and members are encouraged to submit proposals. * Social media content on BMSB and be found at https://youtu.be/0KtzhItf2I0 and @profsuckling.